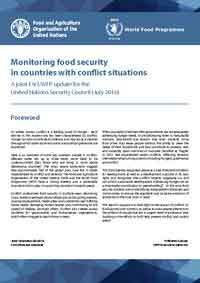 Conflict is a leading cause of hunger and this short document (42 pages) describes hunger resulting from conflict in 17 countries, countries where conflict and hunger have been substantial . It is a joint study by the Food and Agriculture Organization and the World Food Program and available as a free download from FAO. Each of the 17 country briefs provides an overview of people suffering from acute food insecurity and a short description of how conflict has brought about hunger. The regions and countries included are: Latin America: Haiti and Colombia; Africa: Burundi, Central African Republic, Democratic Republic of the Congo, Guinea Bissau, Ivory Coast,Liberia, Mali, Somalia, South Sudan and Sudan; Middle East: Lebanon, Iraq, Syria and Yemen and Asia: Afghanistan.